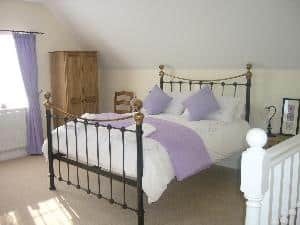 Garth Cottage is a delightful 4 Star self contained cottage set in a quiet peaceful location in the hamlet of Pensham, located part way between Pershore’s two most famous landmarks; the town’s elegant Norman Abbey; and Bredon Hill, the north-westerly outpost of the Cotswolds. The cottage is sited in the owner’s grounds of 2 acres on the banks of the River Avon, less than 10 minutes leisurely walk to the elegant Georgian riverside town of Pershore with its selection of tea rooms, restaurants, 16th century pubs, busy modern theatre, leisure centre, supermarket, convenience shops and covered market. 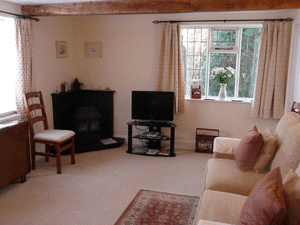 Situated in the beautiful Vale of Evesham; Worcester 11 miles, Cheltenham 15 miles, Gloucester 20 miles and Evesham 6 miles, Garth Cottage is extremely well located for a wide range of sightseeing, visits, activities, shopping and all manner of pursuits to suit all tastes and preferences. A complimentary welcome selection of essentials, a bottle of wine and home made baking are provided upon arrival. The ground floor main entrance opens into the hall. Off the hall is the bathroom, lounge and staircase. First floor bedroom: The large and airy galleried bedroom is equipped with a king size bed with ample space for a separate bed which is installed in accordance with guests requirements. The bedroom includes a modern flat screen colour television; bedside draws with reading lights; two wardrobes; two sets of drawers and mirror; two chairs; free standing tall mirror and a cosy armchair. The bathroom has a bath with shower over, WC, wash hand basin with shaver point and a heated fire. The oak-beamed lounge/dining room has a double bed settee and armchair; full size wide screen colour television, digital box and DVD/CD player; dining table and chairs and gas log burning fire. The kitchen is fully fitted with oven, hob and extractor; microwave and refrigerator with freezer compartment; and all necessary pans, crockery and utensils. Washing machine and tumble dryer in utility room. There is a separate area of garden with garden furniture and barbeque for cottage use. Use of owners heated outdoor swimming pool by arrangement; May to October. Pick up of guests by prior arrangement from Pershore Railway Station (direct London Paddington via Oxford). Bus stops in nearby Pershore. Rates from £290 to £400 per week.